On Friday morning Chris left for Winterfest in Knoxville TN. Winterfest is a youth convention that thousands of young people attend. They have well known speakers and popular christian music artist like Jentzen Franklin, Chris Tomlin, Isreal Houghton & New Breed. I was able to attend last year & it was a great time but I just couldn't leave my little man to go this year. So Chris went along to help chaperone and me & Maddox had a super busy weekend. On Saturday we went with my Mom to Fatz for breakfast. A group of missionaries were having an all you can eat pancake fundraiser for an orphanage in Honduras. Maddox got to eat pancakes for the first time!! He loved them!! After breakfast I did my Mom's hair, then we met Laura & shopped for a little bit and for supper we met Daddy at Surf & Turf in Bessemer City. We went to a fish camp and it was before 6, so we were feeling really young! Ha!! The food was good though!! Maddox only had a one hour nap the whole day but he was still a trooper!! Sunday, Maddox & I went to the early service at church. Chris always does certain things to help get Maddox ready & get us out the door on Sunday mornings so I was really missing him. By 8:30 I was already worn out from all the rushing around. Church was great & we heard a really good word about Gods Grace. My arm is sore today from holding Maddox during all the stand up times. 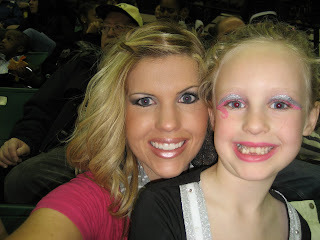 (Once again missing Chris) Then we came back home, changed clothes, reloaded the diaper bag and car, picked up Mom, drove to South Gastonia, picked up Laura, ate at Bojangles then went to UNC Charlotte for Tori's Cheer Competition. 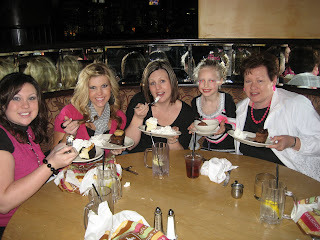 After the competition all the girls went to the Cheesecake Factory. We had so much fun and I love getting to spend time with my family. At 11:00 I finally got to see Chris who I had missed so much. As we were laying in bed, he was telling me about his weekend. He asked me something and I was done a goner. Needless to say, I was really tired!! So over this busy weekend, Maddox started doing some new things. He drank a whole cup of juice from a sippy cup and he can now push himself up from his back into the sitting position!! Saturday night he started crying in his crib so when I went to check on him, I was startled when I saw his head sticking up above the railing!! I'm not use to seeing that. We will be having to lower his mattress soon. I'm sure the pulling up will come next and then the climbing. Oh my goodness I don't know if i'm ready for all that!! Today has been a great day & I'm feeling rested up! I absolutely love getting the extra hour of daylight! I always feel like I don't work as late and I have more energy. It's amazing what daylight can do for ya! I am loving the cheesecake pic! So fun!